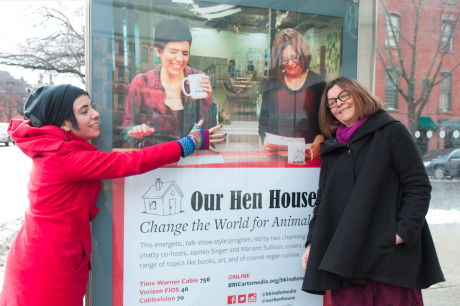 Welcome to the 273rd episode of Our Hen House, a place to find our way to change the world for animals. 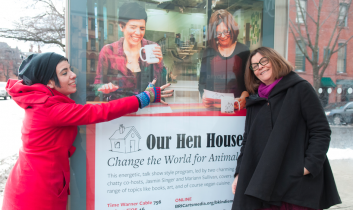 Today we bring you round nine of highlights from the Our Hen House TV show, a co-production with Brooklyn Independent Media. 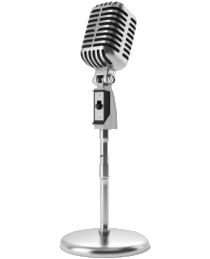 You won’t want to miss the incredible and inspiring interviews with seven powerhouse animal activists, including Neal Harden, master chef at Brooklyn’s own Pickle Shack; Zachary Koval, vegan fitness guru and PETA’s sexiest vegan; Sherry Colb and Michael Dorf, two unfathomably intelligent law professors and authors who use their smarts to advocate for animals; John Bartlett, vegan fashion designer extraordinaire; David Coman-Hidy, executive director of The Humane League; and Michelle Carrera, a longtime social justice activist who is bringing vegan chili to New York’s homeless residents. To curate these segments, we welcome back Our Hen House’s own Media Coordinator Alessandra Seiter, of the of the blog Chickpeas & Change. “Love isn’t about what we did yesterday; it’s about what we do today and tomorrow and the day after.” ~Grace Lee Boggs.